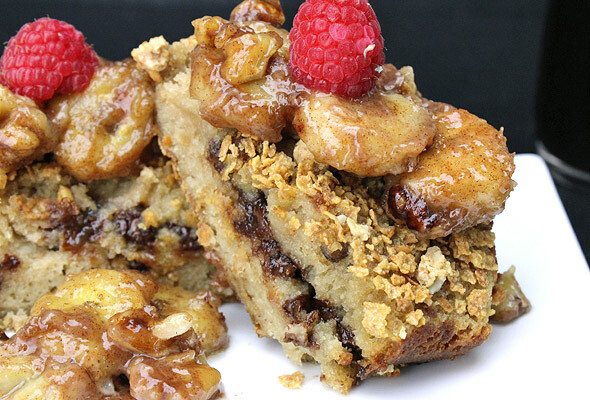 Prepare the Banana Walnut Pancake Topping using this recipe. Keep it warm over low heat - stirring occasionally - as you make the French toast. In a medium bowl, beat the eggs and then whisk in the milk, sugar, vanilla and salt. Transfer mixture to a shallow baking pan. Place the bread slices side-by-side in the egg mixture. After 30 seconds, flip them over and let them set for 30 more seconds. Transfer wet slices to a flat working surface (like a large cutting board). Over 4 of the 8 slices, sprinkle equal amounts of mini chocolate chips. Press them gently into the bread to make room for all of the chips. 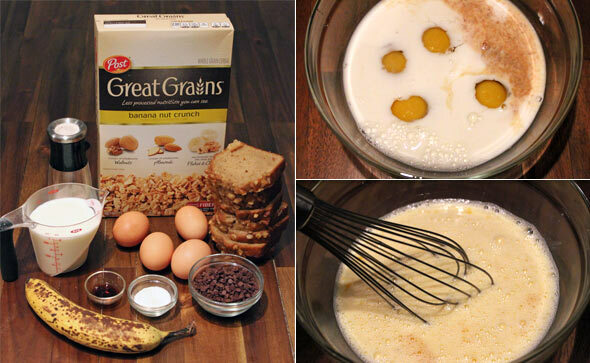 Place equal numbers of banana slices over the chocolate chips. Place the slices without toppings over the slices with toppings to form 4 sandwiches. Place the 'sandwiches' on a parchment-lined cookie sheet. Place 1/4 cup of crushed cereal on top of each sandwich. Gently press it into the sandwiches to form a fairly even layer. Bake at 350 degrees for 20 to 25 minutes until tops start to brown. 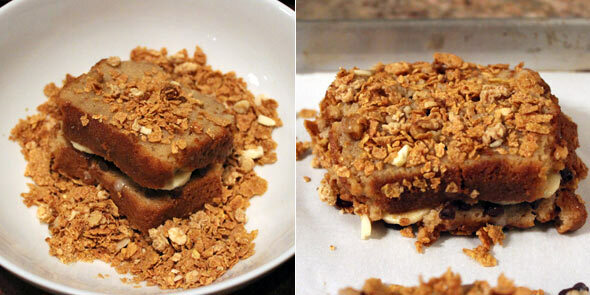 Let set for 5 minutes and top each serving with Banana Walnut Topping. The banana bread will become very tender after being submerged in the egg mixture. To prevent the bread from tearing, use a spatula to handle the slices once they are wet. One of the images above is misleading. I first tried placing the 'sandwiches' in a bowl of crushed cereal to coat all sides. That method made my bread tear. I then tried placing the sandwiches on a cookie sheet and coating only the top side. That worked great and is reflected in the text of the recipe. 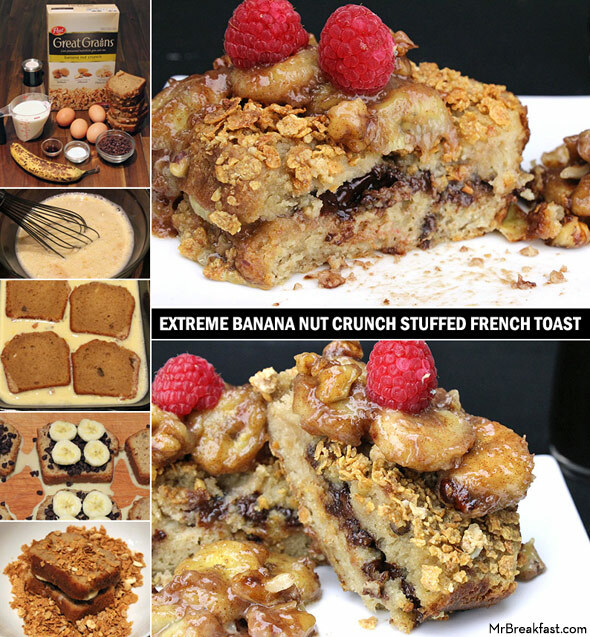 This French toast has extreme banana flavor. 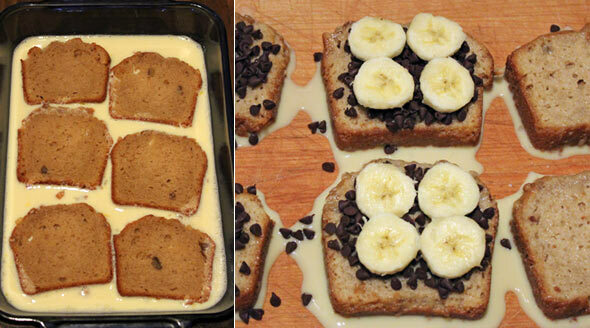 It's made with banana bread. There's a filling of banana and chocolate. 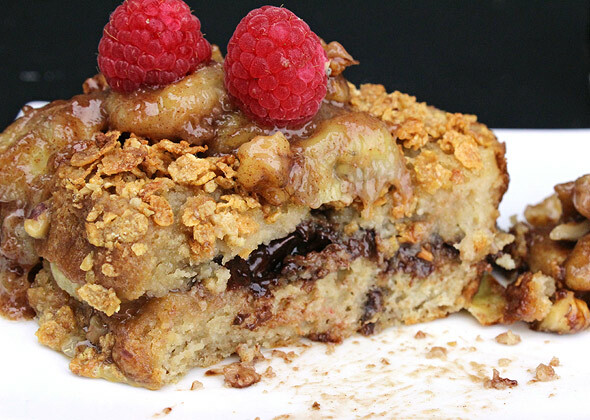 It's coated with Banana Nut Crunch cereal and then it's covered with a warm Banana Walnut Topping. Now, that's bananas! Recipe number 3270. Submitted 11/21/2015.